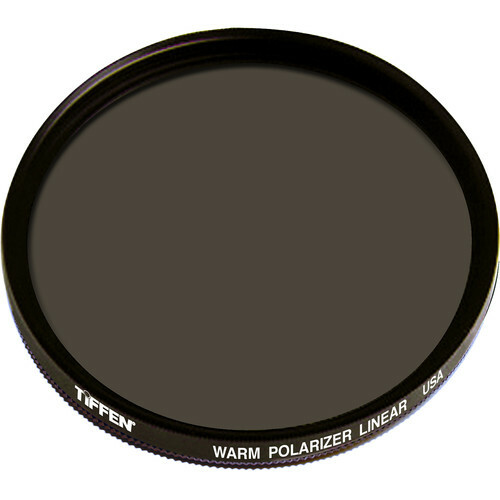 The Tiffen 58mm Warm Linear Polarizer Filter can be applied to create a warm cast over an entire image while helping to reduce reflections and glare by filtering out light that has become polarized due to reflection from a non-metallic surface. The light from the sun naturally becomes partially polarized due to reflecting off electrons in air molecules, causing the light to scatter into what appears as haze. A polarizing filter arranges, and filters, this directionally polarized light perpendicularly to the reflected light, allowing for the absorption of much of this light. This results in a noticeable reduction of glare and reflections from non-metallic surfaces and an increase in the saturation of skies and foliage. The warming effect of this filter can be obtained under daylight when this filter is used on a film camera system with daylight film installed, or on a digital camera system with its daylight white balance setting selected. This filter's overall coloration reflects a mired shift value of +45. A linear polarizer differs from a circular polarizer in that it does not contain an additional quarter wave plane. The addition of a quarter wave plane is to circularly polarize linearly polarized light for the use of auto focus and exposure functions. Due to how the light is broken down and filtered with a linear polarizer, in-camera auto focus and exposure accuracy become skewed during use. When the light becomes circularly polarized, it permits the use of these functions. This filter is recommended when not using in-camera exposure metering or autofocus, is non-coated, and has approximately 40% average light transmission. It is constructed from optical glass for clarity as well as color fidelity and features an aluminum-alloy filter ring that can be rotated in order to adjust the intensity of the polarization effect. 58mm Warm Linear Polarizer Filter is rated 5.0 out of 5 by 1. Rated 5 out of 5 by Anonymous from Very happy Since I am relatively new to photography, I decided to take professional photography lessons. It was suggested by the instructor to purchase these 3 things to help us get started. Wow - what a difference the filters made. I also used the remote switch for the first time. Our class took a field trip to our local historical cemetery and I used all three things that I purchased. We are taking another field trip to the local coast line this weekend for a few days and am really excited to use all of my purchases again to see what results I get. I will definitely buy from your company again!